Safdie Architects, Crystal Bridges Museum of American Art, 2011, Bentonville, AR. Photo: Timothy Hursley. The succinct, just-the-facts style of Wikipedia goes a lot further in fixing the surfaces of Bentonville than any lyric acrobatics might. A location scout would have trouble picking the town out of a lineup; put simply, it lacks the texture of the specific. It could be anywhere and everywhereit is a murmur in the great cacophony of murmurs evoked by the phrase small-town America. And it is precisely Bentonville’s anywhere status that made it the perfect test site for one of the shrewdest, most carnivorous mercantile models on the planet, a big-box commercial strategy that translates everywhere. It is here that Alice Walton, the daughter of Walmart founder Sam Walton and the third-richest woman in the world, decided to sow specificity. Suddenly, Bentonville is somewhere; it is a destination. Crystal Bridges: The name is both quaint and fantastical, in the manner of a Stevie Nicks song. Even within the already ludicrous, shiny, and fanciful history of institutions born from singular visions and deep pockets, there’s something crazily quixotic about Alice Walton’s ludicrous, shiny, and fanciful new museum. It is something Walt Disney might have hallucinated while visiting Isabella Stewart Gardner’s ersatz Renaissance palace in Boston. At once hubristic and grounded, the two-hundred-thousand-square-foot museum (fifty thousand square feet for gallery space), designed by the Haifa, Israel–born, Boston-based architect Moshe Safdie, is a harmonious compound of eight linked concrete pavilionsseveral striated with bands of inlaid wood and canopied with glass and coppernestled by Crystal Spring amid 120 acres of forest near Bentonville’s downtown. Crystal Bridges Museum of American Art is absurdly well positioned in the competition for global museological resources. Endowed by the Walton Family Foundation with eight hundred million dollars (more than New York’s Museum of Modern Art), it opened on November 11 of last year with a party in Bentonville, where Bill Clinton addressed the crowds via video while confetti cannons blitzed the air with paper. So far it doesn’t look that different, but one gets Houston’s drift, and certainly the installation of these works in the piedmont of the Ozarks stages its own phenomenological environmenta “place-based sensibility,” as the museum’s director, Don Bacigalupi, put italmost regardless of what’s on view. Walton largely culled the collection of some twelve hundred works herself, in conversation with a few advisers, so it’s no surprise that the assemblage occasionally reads as the harvest of an eclectic but assured connoisseur. It might be a surprise that a lot of the work is very, very good. As has been widely reported, there are “genuine” masterworks in the inaugural exhibition, “Celebrating the American Spirit.” These are some great paintings. But great paintings only tell so much of the story of American art. The story thus far, in any case, is provisional; this is a “first pass,” a single presentation of more than four hundred works from the nascent collection (evolving is the buzzword). Currently, its strengths are colonial portraiture and paintings of the Hudson River School along with strong groupings of individual artists such as Marsden Hartley, George Bellows, and Stuart Davis. The view from Arkansas is not unfamiliar to the gimlet New York eye; the majority of the works here, to speak of place-based sensibility, were created in the environs of the Northeast Corridor. Every museum is to some extent a moral project, the calcification of a donnée. Here, one constitutive trope is citizenship, the territorial push-pull of regionalism, nationalism, and globalism. But the curators aren’t too fussy about what counts as American. The collection includes European-born artistsThomas Cole, John Singer Sargent, Hans Hofmann, Arshile Gorky, and Josef Albers, to name a fewand there are landscapes depicting Europe (for instance, an 1896 painting by James McNeill Whistler, that most peripatetic of “American” artists, of the port town of Dieppe, France) and South America (such as Martin Johnson Heade’s The Harbor at Rio de Janeiro, 1864). Like any good student, this American museum has also gone abroad, partnering with the Louvre in Paris, Atlanta’s High Museum of Art, and the Terra Foundation for American Art to produce shows of American and European art in the US and beyond. (An exhibition on Thomas Cole is currently in Paris and will travel to Bentonville in May.) 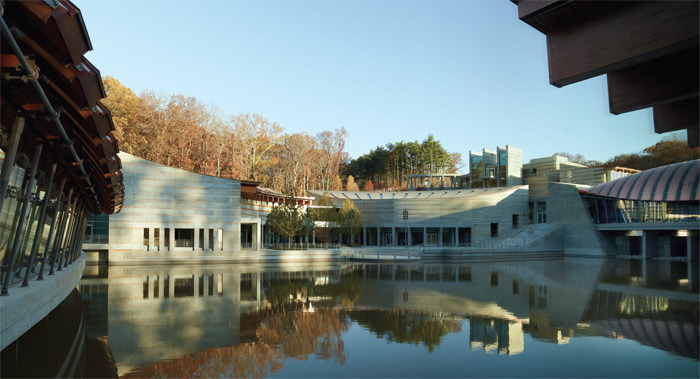 Closer to home, the nearest museum of note is the Nelson-Atkins Museum of Art in Kansas City, Missouri, more than two hundred miles north on Route 71, and with this in mind Crystal Bridges has developed strategies for habituating previously uninitiated guests. The museum has an ambitious outreach program that targets some eighty thousand local schoolchildren. Walmart donated twenty million dollars to cover admission for the foreseeable future, so you can walk right in. On a practical level, this is huge. The museum suspires friendliness and accessibility from the get-go. This congeniality is further institutionalized via dedicated “gallery guides.” “You need to step back to see it,” a volunteer docent, Stacy, told me as I approached Devorah Sperber’s After the Last Supper, 2005. The work is a popular installation involving 20,736 spools of thread and a crystal ball; it appears here in “Wonder World,” an uneven if jubilant show of contemporary art in the museum’s temporary-exhibition pavilion. “She’s a scientist, so each of her pieces is meant to teach us something. This one is about how our eyes and mind work together.” The rest of “Wonder World” also trades on this lighthearted philosophizing on the senses: There’s a Vik Muniz photograph riffing on a Heade nature study (a work by Heade that is similar to the original is also in the collection). There’s a silly, interactive John Baldessari wall sculpture comprising a fiberglass ear and an ear trumpet that plays Beethoven’s Quartet in A Minor, op. 132, when you speak into it. A large Nam June Paik TV-sculpture/portrait of John Cage is one of the only “video” works in the collection. The show has all the zest and porous appeal of the “contemporary.” People seemed to dig it. What is perhaps unusual about the view from Arkansas is the museum’s unambiguous embrace of women artists. (The catalogue conflates works by women with those featuring female sitters, emphasizing the “presence of strong women both as maker and as subject.” I kept envisioning a jewel-box survey: “From Abigaill Levy Franks to Jeanne Blazy: Brassy Broads of American Portraiture.”) The highlighted painting in the Abstract Expressionist galleries is an untitled Joan Mitchell from 1952–53, and instead of a Jackson Pollock drip painting, you have an earlier drip made by Janet Sobel that anticipates his allover murals. The “anchor” work in the gallery devoted to twentieth-century modernism is a large black wall piece by Louise Nevelson. Sculptures by Lynda Benglis (saturnine), Jackie Ferrara (scrupulous), and Louise Bourgeois (sybaritic) preside in the final building. In purely identitarian terms, the collection is remarkably progressive. But it also (quite literally) paints over many of the past century’s great artistic casus belli. The critiques of painting and sculpture occasioned by Conceptual art, Minimalism, Fluxus, the Pictures generation, and, um, Duchamp (and even whole artmaking modes like photography, video, performance, and installation art) are hardly, if ever, considered. The wall text for a smart-looking pastel Dan Flavin, Untitled (to Mr. and Mrs. Thomas Inch), 1964a rare example of Minimalism in the collectionemphasizes a resonance with the use of light in the Hudson River School. Here, Flavin’s industrial objects represent a continuation of painting, not a rupture with it. This glossing is especially pointed in the final area of the twentieth-century gallery, where a wall text articulates “postmodernism” in relation to five heterogeneous but museum-friendly artists: Susan Rothenberg, Neil Welliver, Jack Levine, Kara Walker, and Kerry James Marshall. Their works, the text argues, “demonstrate the renewed vitality and enduring relevance of perception-based narrative art.” If Crystal Bridges’s inclusion of “postmodernism” is potentially constructive, we may still wonder what gets camouflaged or bowdlerized in this description. Is either a plein air painter like Welliver or a conventional satirist like Levine germane to even the most flexible account of American postmodernism? And if postmodernism stages a resurgence of “image-based” work, as the text also claims, wouldn’t artists from preceding galleries (Warhol, Rauschenberg, Johns) have been more reliable narrators? Postmodernism has never been an intelligible idiom (part of its dangerous charm), but lumping iconoclastic African-American artists like Walker and Marshall in with mild realists like Welliver and Levine and estranged Minimalists like Rothenberg just underscores the absurdity of the term’s macaronic tendencies and works against two of the exhibition’s high points: Walker’s startling tapestry A Warm Summer Evening in 1863, 2008, and Marshall’s lampoon of the white picturesque, Our Town, 1995. And yet the doubt begs some benefit. I’d like to think that the use of Rothenberg’s Four Color Horse, 1976, as a signpost for postmodernism is also a riff on the fact that the museum was founded by a prizewinning equestrian. (“There is a lot that horses and art share in common,” Walton told the New Yorker last summer.) If so, there’s a playfulness here that rhymes with other “private” jokes and quirks, like Tom Wesselmann’s Smoker #9, 1973 (Walton is reportedly trying to kick the habit), and Warhol’s perfectly apropos Dolly Parton, 1985. The bleached-out, bewigged Dogpatch Diva is a mere souvenir in auction terms, but she’s a better fit for Crystal Bridges than ostensibly swankier antiques like Liz or Marilyn. Dolly Parton exploits the museum’s “place-based sensibility,” functioning as an epistemological switch point for the global and the local, North and South, urban and rural, artifice and nature, connoisseurship and tastelessness. She might be the beginning of something like the view from here, a deterritorialization that takes us from the brink of whatever-space to somewhere and back again. David Velasco is editor of artforum.com and a regular contributor to Artforum.